For some reason it has become fashionable to dress up our dogs in outfits rather than let them just wear their own fur coats! Businesses have sprung up everywhere selling items such as dresses, dog sweaters and puppy clothes. 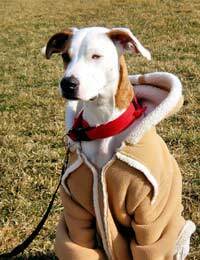 It makes sense for dogs that are elderly, infirm or have very little coat to wear pet clothes to keep them warm. Years ago this would have been a simply waterproof jacket or a tartan coat. These days’ pet clothes are seen on all dogs from Chihuahua to afghan hounds. Damp and wet weather can be awful for taking dogs for walks if they have long coats. A shower proof dog coat with leggings will mean the dog can enjoy his exercise without having to have a wash every time he step paws outside his front door. Specially made puppy clothes will also keep a young dog warm and dry. Boots can also be made to fit a dogs four paws. These are ideal for walking in the towns so muck and grease does not irritate their paws or to protect cuts and sore pads. For show dogs with long coats boots are a boon before a show and mean the dog can be exercised normally without fear of dirtying the legs. Dog sweaters can be purchased or even knitted from patterns by the owners. Arran, cable and chunky knit can now be seen on dogs as well as owners. These can be made to measure or bought off the peg from companies selling pet supplies. At Christmas and on a dog’s birthday it is possible to purchase dog gifts from these pet supplies outlets such as a special outfits or a tasty homemade snack. Show dogs and their owners attending Crufts are faced with many traders selling outrageous outfits for dogs. You will not often see the exhibitors purchasing these pet clothes it is the many thousands of visitors who attend Crufts that buy puppy clothes, dog sweaters and other dog gifts. However the TV cameras always home in on these stands to ridicule the exhibitors rather than look to the sensible dog coats that are needed to keep a show dog clean and dry. It is celebrities and reality stars that first started to dress their dogs in designer dog sweaters puppy clothes and dresses. They also carried their small dogs in handbags or tucked under one arm. The poor animals were never seen walking or if they did it would be with a burly minder and not the owner. Strangely rather than decry the fate of these poor little dogs the general public copied their idols and the manufacture of designer dog clothes and pet supplies went ballistic. Some stars even wore the dame outfits as their pets! It is also possible to purchase fancy dress outfits for dogs to wear for any occasion from Christmas through Easter to Halloween. If only our dogs could talk surely they would tell us how ridiculous they felt! Hopefully this is a craze that will fade before too long and our favourite pets can go back to their natural dog coats – their own fur coats.